Opinion: Ben Affleck as Batman! Was Kermit the Frog unavailable? Ben Affleck as Batman, I don’t think that had any ability to invoke intimidation for any audience, Bane, the Joker, let alone Missy Piggy. There had been a reason Warner Brothers had offered Christian Bale $50 million dollars to reprise his role. Christian Bale had been a psychotic killer in American Psycho. Now that had brought some gravitas to the role. As matter of fact, look at some of Christian Bale’s cinematic pedigree that he had brought to the Batman franchise. If you had wanted a cardboard puppet performance perhaps, Ben Affleck. 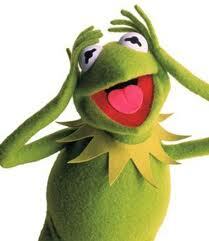 Perhaps, I had lost my mind like Kermit the Frog, but just your average American film viewer. If you think I had been on the money, sign the online petition with Warner Brothers. Otherwise, fire away. This entry was posted in Film and tagged Ben Affleck as Batman cast Kermit the Frog., film. Bookmark the permalink. Honey Dates? They look awful!